Still one of my fav movies for dialogue. 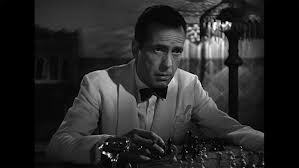 And it stars Humphrey Bogart, my first love, well, one of the firsts, it’s hard to remember. Sadly, Ingrid Bergman is more of a Barbie figure with limited facial expressions: worried and adoring, sometimes worriedly adoring or adoringly worried. I never thought this was her best, although I loved her wardrobe. This was a love story with a perfect ending. If that doesn’t satisfy the viewer you can always imagine Ilsa and Richard get together after the war when Laszlo doesn’t need her strength anymore. If you’ve never given yourself the gift of watching this movie, do so. If you have, do it again…you’re worth it. Casablanca wasn’t expected to be a hit, just one in a string of patriotic World War II films and Bogart’s first try as a leading man. Bit of a shock when it went on to be one of the greatest movies of all time. 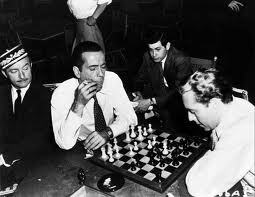 Humphrey Bogart was a brilliant chess player. 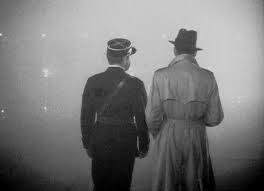 Many extras in Casablanca were European émigrés who shed real tears while filming the battle of the anthems scene. Conrad Veidt, (Major Strasser) had escaped with his Jewish wife from Germany in 1933 when he learned he was being targeted by the SS. Veidt was resolute in being cast only as Nazi villains believing it would help the war effort. Even though it’s in black and white (spare yourself the horror of the Colorized version) we know the colour of Ilsa’s dress the day the Germans invaded Paris. “The Germans wore gray. You wore blue”. There’s been talk of a sequel and a few unsuccessful remakes and prequels, but no success. 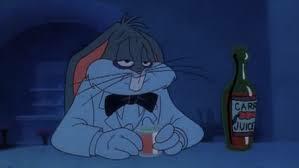 However, I did love Bugs Bunny in Carrotblanca and The Marx Bros in A Night in Casablanca. 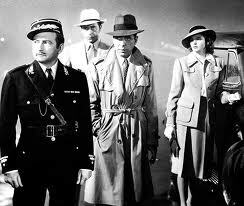 No one in Casablanca ever says, “Play it again Sam”…one of the most famous misquotes of all time. 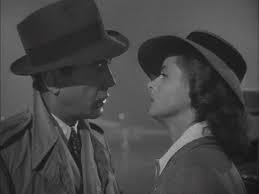 Rick dramatically reads the dissolving note from Ilsa in the rain at the train station in Paris…seconds later he and Sam are getting on the train, dry as a bone. Humphrey Bogart, Sydney Greenstreet, and Peter Lorre (he was sooo cool) had previously appeared in the amazing The Maltese Falcon together. Dooley Wilson (Sam) was actually a drummer; didn’t play piano.